With the summer hotting up, beauty brand Make Up Eraser has introduced a trio of bright and bold prints to its Original range: Flamingo, Watermelon and Tropical. The reusable MakeUp Eraser is perfect for trips away, for everyday and particularly useful in your gym bag. 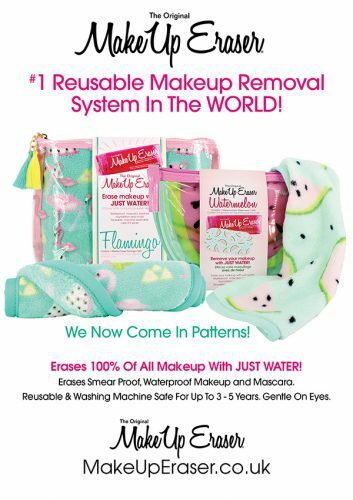 MakeUp Eraser is designed to remove every speck of your makeup, including waterproof mascara, eyeliner, and lipstick, with water alone. What’s more the microfibre MakeUp Eraser is machine washable, lasts more the 1,000 washes and will save you £100’s, eliminating the need for cleansers and eye makeup removers. The pretty Limited Edition Flamingo & Cactus MakeUp Eraser (RRP £17.00) is ideal if you want to fly away, removing the need to pack liquid cleansers and removers and it also comes complete with a custom, compact waterproof printed carry bag. Designed in Paris the Limited-Edition Watermelon MakeUp Eraser (RRP £17.00) is perfect for carrying in your overnight bag, ensuring your skin in squeaky clean and glowing. Not drying or abrasive this ultra soft cloth comes with a bright waterproof bag, so you can throw it in with your gym kit straight from your shower. Ideal for an everyday deep cleansing treat for your skin, this summer sees the new stylish Tropical MakeUp Eraser (RRP £17.00), which is inspired by the flowers and bright foliage of the tropics, joins the range permanently. How to use it: To use the dual-sided MakeUp Eraser, soak with warm water and, using the short nap side, gently rub in a circular motion. This quickly and completely removes your makeup without the need for chemicals or cleansers, leaving your skin perfectly clean. For a gentle exfoliation, simply flip the MakeUp Eraser and repeat the process, letting the long nap side deep cleanse your pores. • MakeUp Eraser’s gentle cleansing process promotes healthy skin because it doesn’t affect the skin’s natural acid mantle.